Here are five magnificent locations that can only be reached by boat. This bay was named after the man who was sailing for recreation and stumbled across this serene bay. This quiet bay is secluded from the wind offering a safe and warm place to drop anchor for sunbathing and swimming. 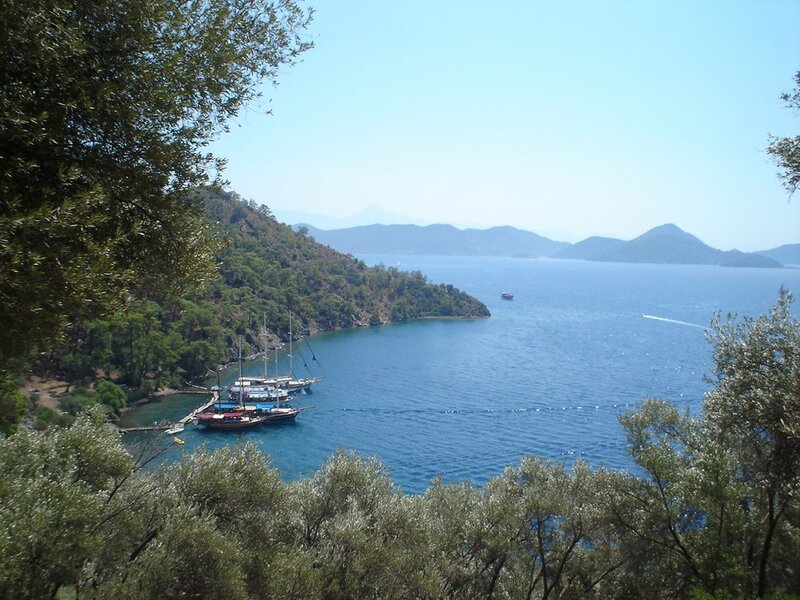 The island offers a gentle hill to the bay with naturally growing pine and olive trees. Dotted on the hill are Lycian rock tombs that have remained mostly undisturbed. Along with the free-standing tombs, there are also a few tombs carved into the nearby cliffs that would have been for the rich and powerful. This island is the third largest in the Greek Dodecanese island chain. This island has been in the spotlight throughout history and also now for modern tourism. This island holds many reminders of the past alongside sandy beaches and traditional Greek houses. A particular place that is fascinating to visit is the ancient medical centre of Asklepieion. This ancient town was the home of modern medicine and birthplace of the Hippocratic oath. During summer months the town has various festivals to celebrate the history of what this small island created for Greece and for the ancient world. This small island has gained fame due to two reasons; one is the amazing beauty of the location, with one side a wide-open view of the Aegean Sea and on the other, a view of BabaDag mountain with its pine forests. While the views around this island are spectacular, the history of the island is equally fascinating. This island is said to be the resting place for Saint Nicholas, the man that the stories of Santa Claus are supposedly based on. The man St. Nicholas was famed for being very generous, especially so to children. The island that now allegedly hold his remains was built by him as a religious place of refuge but built in a way that did not destroy nature of the island itself. This small island is the home to an idyllic town that has grown around the natural features without destroying them. The island has had a varied history with many nations controlling the island thus adding their own flare to the styles. Leros’ history has been dated back as far as 8000 BC from artefacts in local ruins. Due to its small size and history it makes for a wonderful place to explore and view all of the elements that have created this sought-after town. A Key attraction is the castle at Platanos that stands proudly on the hill above that was used as a defence point. A popular photography point is the windmills of Leros. These windmills were traditionally used as grain processing but now are home to terraces where visitors can sit and enjoy the view. These ancient ruins remain from the thriving Lycian population. Due to an unfortunate combination of earthquakes and piracy, they eventually left this land behind. The earthquakes caused devastation for a small town like this as it sunk a portion of the town into the Aegean Sea. Following this, they had times of piracy that affected the growth and economy of the town leading to its eventual abandonment. Today the area is considered a protected site. While the part of the town that is on land welcomes visitors to explore, the underwater sections have been kept clear to preserve what is left of the ruins. These wonderful places can only be reached by sea vessel and are accessible from some of the most scenic locations on the Turkish coast. A journey on the sea that witnesses two cultures thriving right next to each other makes for an unforgettable experience.